Pre-sorted ortho-water and para-water molecules with differently oriented nuclear spins (blue or red arrows) react with diazenylium ions (center left) at different speeds. 31-May-2018: Water molecules exist in two different forms with almost identical physical properties. For the first time, researchers have succeeded in separating the two forms to show that they can exhibit different chemical reactivities. These results were reported by researchers from the University of Basel and their colleagues in Hamburg in the scientific journal Nature Communications. From a chemical perspective, water is a molecule in which a single oxygen atom is linked to two hydrogen atoms. It is less well known that water exists in two different forms (isomers) at the molecular level. The difference lies in the relative orientation of the nuclear spins of the two hydrogen atoms. Depending on whether the spins are aligned in the same or opposite direction, one refers to ortho- or para-water. 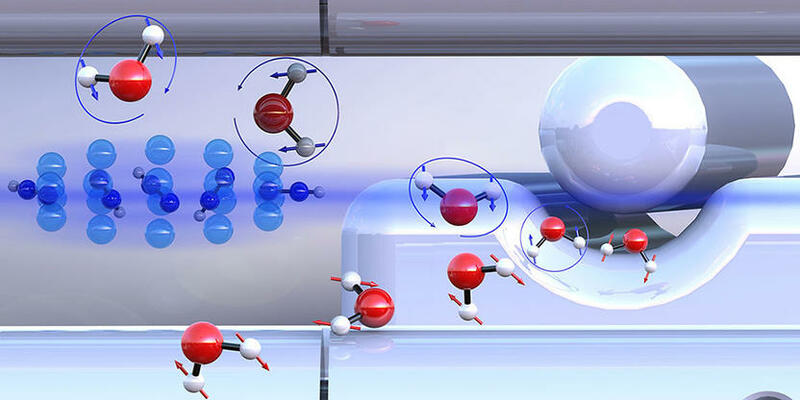 The research group headed by Professor Stefan Willitsch from the University of Basel’s Department of Chemistry has investigated how the two forms of water differ in terms of their chemical reactivity – their ability to undergo a chemical reaction. Both isomers have almost identical physical properties which makes their separation particularly challenging. This separation was made possible by a method based on electric fields developed by Professor Jochen Küpper from the Hamburg Center for Free-Electron Laser Science. Using this approach, the researchers were able to initiate controlled reactions between the “pre-sorted” water isomers and ultracold diazenylium ions (“protonated nitrogen”) held in a trap. During this process, a diazenylium ion transfers its proton to a water molecule. This reaction is also observed in the chemistry of interstellar space. It was demonstrated that para-water reacts about 25% faster than ortho-water. This effect can be explained in terms of the nuclear spin also influencing the rotation of the water molecules. As a result, different attractive forces act between the reaction partners. Para-water is able to attract its reaction partner more strongly than the ortho-form, which leads to an increased chemical reactivity. Computer simulations confirmed these experimental findings.